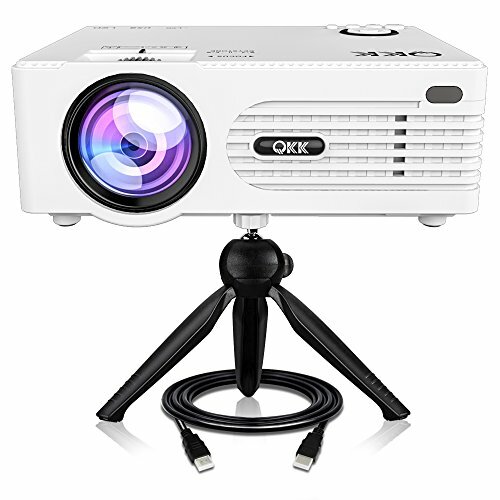 QKK 2400Lux Mini Projector Full HD LED Projector 1080P is currently selling at $79.99, approximately $1.55 higher than average. With a lowest price of $76.99 and an average of $78.44 it is selling on the high end of its usual range. Price volatility is 0.89% (meaning it does not change often), so you might have to wait a while for the price to drop. Right now this product is a recommended 'ok deal'. Compare the current price, savings (in dollars & percent) and Buy Ratings for the top Portable Projectors that are closely related to QKK 2400Lux Mini Projector Full HD LED Projector 1080P. Here is how QKK 2400Lux Mini Projector Full HD LED Projector 1080P compares with other leading Portable Projectors. Features Full HD 2018 Latest Upgraded Projector 1080P Supported - Our QKK 2018 Latest Upgraded Mini Projector is gread designed for indoor and out door movies in dark. You will surely enjoy your happiness movie night with your family easily. [Not Recommended For PPT Presentation! ] Highest Native Resolutions on The Market: QKK home theater projector supports 1920*1080 resolution with 50,000 hours long term lamp life, 2000:1 contrast ratio, 16::9 aspect ratio, 32-176" big screen display at the distance of 1.5M-5M. (Ideal distance is 3.5M with 120" display. ) Double USB Port Designed Projector - Cocerned about many customers need to use 2 USB flash drives at the same time, QKK mini projector technical team worked hardly and successfully added another usb port on the projector (The only mini projector which has this feature on the market). 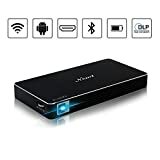 By doing this, you can use two USB thumb drives at the same time. Multimedia Home Theater Mini Projector - QKK full hd projector also has HDMI, AV, VGA, SD Card port, which allows you to use it with Laptop, PCs, TV Box, Amazon Fire TV Stick, ChromeBook, Tablets, Blue-ray DVD player, SD Card, USB Flash Drive, Media players (Music, Pictures, Video), iPad, iPhone, Android Smartphones ( Wireless HDMI Dongle not included).